From the physics published in his lifetime, William Gilbert or William Gilberd (1544-1603) seemed like Galileo to be largely concerned with experimental physics and less with theory. 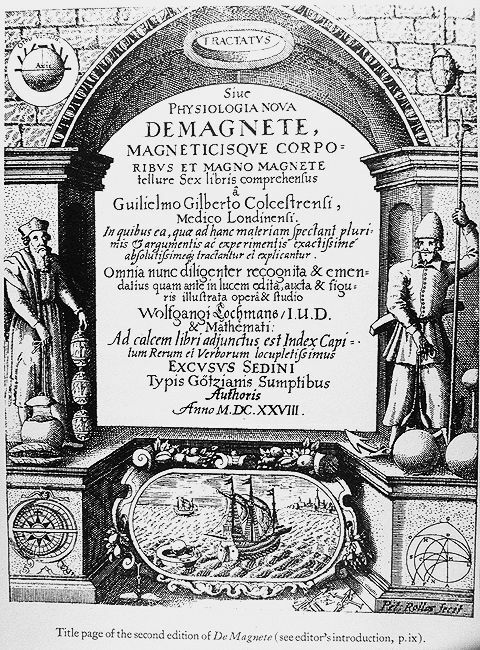 The one work he published under some peer constraint, in 1600 in Latin, was "De magnete, magneticisque corporibus et de magno magnete tellure; Physiologia nova, plurimis et argumentis et experimentis demonstrata." ('On the magnet, magnetic bodies and the great magnet the earth; A new science, with many both argument and experiment proofs.'). It was first translated into English nearly 300 years after Gilbert's death, in two versions that both failed to at all clearly present his science theory. See the currently free online new improved English translation De Magnete. Also available as an A4 paperback book 'On The Magnet' or with New Science Theory, or as an ebook 'On The Magnet ebook'. As a physician to England's rulers and Royal College of Physicians president, Gilbert was eminent in medicine and a hobby or amateur physicist who put much into his physics. De Magnete was a new science work mostly on magnetism with much polemic against mere theorising and for the new experimental science, and was condemned by the Catholic Inquisition. Its new physics theory was patchily put, buried in pro-experiment polemic and discussion of the more baseless musings or mere theorisings of others. Its new experiments and unique theory were clouded by the use of unique new Latin terminology that made its science difficult to really understand. Gilberts physics theory ideas only became slightly more widely known 50 years after his death when his 'De Mundo' was first published still only in Latin. But now over 400 years after Gilbert's death, 2019 still sees little real backing for a first translation of this into English or any other modern language. Gilbert for his 1600 De Magnete in its preface notably claimed "and the causes are made known of those things which, either through the ignorance of the ancients or the neglect of moderns, have remained unrecognized and overlooked." For when experimental science proper was first developing in Europe with Gilbert and Galileo, the prevailing scholarly philosophy of nature was based on mere thought and was that of Aristotle backed by governments and religion. In Aristotle's divine universe every thing was to some extent self-acting (or 'animate') and thinking, with divinely set motivations and knowledge - so that objects fell to the ground because they 'sought to move themselves to their natural place'. Gilbert and Galileo saw this as involving too much irrational supposition and unable to describe the complex realities of actual natural phenomena shown in experiments to accord with invariant laws of behaviour. More than any other physicist Gilbert had widely studied all the proto-science thinkings of ancient Greek, Arabic, Chinese and other writings being basically everone in the field all of which he referenced and which no other scientist emulated as fully. While Galileo and others chose to just study and follow simple ancient greek early-Atomist push-physics 'dead matter with law determinism' theory, Gilbert chiefly promoted experiment and initially gave little prominence to the new physics theory that he had developed from his experiments, though promoting this more in his 'De Mundo' published unfortunately long after his death. His 'De Magnete' really presented a new big TOE physics, seemingly hoping to minimise religious opposition by presenting as a small specialised magnetism work. It seems that a very wary Gilbert maybe wanted to bring out his science somewhat quietly under-the-radar, and it surely was a rather low-impact publishing. So his failing to include his key theory term 'effluvium' in De Magnete's 'Interpretation of Certain Words' may well have been part of his intentional playing-down of his theory relative to his experiments. Gilbert's new 'magnetical physics' or 'attraction physics' did retain a type of Aristotlian self-action for bodies but, very contrary to Aristotle, only as combined with Democritus Greek-atomist style 'non-free-will-thinking' deterministic automatic invariant law responses to his postulated emitted signals or 'effluvia' (involving no pushing, no free-will-thinking and no god) - so stones fell to the ground only with a specific acceleration in response to a specific strength and direction of gravity signals from the Earth. Where both Galileo and Descartes basicly saw only the mechanical push as determinist, Gilbert saw that at least some of the non-mechanical could also be deterministic. In this Gilbert was maybe somewhat akin to Kepler's pre-1600 maths-universe 'Mysterium Cosmographicum' position of Kepler unlike most others seemingly seeing mathematics as somehow 'physical'. Gilbert hence postulated a new signal-response information-transfer universe of self-acting robot objects basically, and allowed that physical causations might mostly involve either material or non-material (energy) signals and that only for some minor phenomena might physical pushings be actually involved. Cartesian-style science dualism had what is basically an undefined 'free-will thinking' that is like requiring a TV to change channels with no remote-control signal or other action ? Gilbert saw his experiments as experimentally proving that all physical causation involves determinate automatic responses to signals or 'simple thinking', so that actual thinking might then also seem proven as being physical and science as basically offering a potentially complete explanation of the universe - though Gilbert himself did not publicly conclude that and did allow of a God. But the physics of Gilbert was potentially the most complete physics. But this was before remotes and computers became common though such ideas were clearly anticipated in Gilbert's physics and its part-development by Newton and sixteenth century words were maybe not really up to explaining this new signal-response physics theory. Nor was his attempt at updating Latin and his writing aimed at the most intelligent discerning reader including much useless entertaining chat, so his theory really requires some substantial elucidating. While Gilbert produced his action-at-distance physics himself from his experiments, Galileo and later Descartes just lifted their push-physics theory from the ancient-greeks based on no experiments at all. But with 1600 Catholic Europe far outnumbering Protestant Europe, their actually less scientific Catholic physics did prevail. So the greatest English scientist was probably one of the world's first, father-of-Newton, William Gilbert who in addition to his magnetism and eletricity developed his unique action-at-distance signal-response remote-control physics against Galileo-backed simple push-physics. His main physics ideas have long been unreasonably discounted, leaving only minor unavoidable acknowledgement of his magnetism and electricity experiments. Of course Gilbert had grasped the nettle of 'action at distance' or 'remote-control' - the then most difficult theoretical problem for science to explain. How could bodies, separated and seemingly with nothing in-between them, influence each other ? Besides magnetism, his De Magnete did examine to some extent other 'action at distance' phenomena including especially static electricity and to an extent gravity. It did back the astronomy of Copernicus with an almost final statement of De Magnete acclaiming Copernicus as 'The Restorer of Astronomy', but Gilbert also concluded that his own magnetism experiments added further proof of planetary bodies spinning though not of their orbiting. He argued at some length that observations of the Sun daily rising in the East and setting in the West was not proof that the Sun orbits Earth daily, and that other observations or experiments supported the different explanation of Earth being a big sphere that revolves daily so that things that observations or experiments strongly suggest are true can be entirely wrong. And at the time Copernicus did not actually have a strong case for all of his astronomy and knew that. Robert Hooke's 1674 'An attempt to prove the motion of the Earth' said Copernicus could not prove Earth orbits the Sun, only that it was probable, but that he could prove it with the evidence of his more powerful telescope. (Newton later showed that Gilbert's attraction physics did add also further proof of planetary orbitings if given the right mathematics.) Gilbert developed this view more fully in his later De Mundo, adding the proposition that the Earth's 24 hour spin was probably initiated by magnetism (though a steady magnetism that initiates the rotation of a body also brings it to a halt unlike a temporary magnetism, and it was later also discovered that some spins can generate magnetism). In 'De Magnete', the Preface of Edward Wright more clearly supports Earth's rotation but not its orbiting. But while Copernicus and most early scientists had not sought to develop any theory explaining the why / how of planetary motion or of any 'action at a distance', Gilbert did. His experiments really disproved simple Greek-Atomist push-physics, as he firmly claimed, though most physicists of the time failed to accept his disproofs which most of them had undoubtedly not understood. Some saw action-at-distance as too similar to how Magic was claimed to work, and some saw it as too similar to how God was claimed to work, but Gilbert was only concerned with how his actual experiments proved physical forces actually work. And his experiments proved the intricacies of magnetic force with its attraction, repulsion and orientation motions that could not really be explained by any simple push-physics. Gilbert's new Magnetical Science was an automatic-response-to-emitted-signals physics, involving different types of attraction and/or repulsion 'magnetical' signals to which different bodies responded - including for him at least 4 'magnetical' signal types being magnetic, electric charge, terrestrial gravity and inter-planetary attraction [Newton later concluded that the last two were the same gravity]. Gilbert termed such signal emissions generally as 'effluvia' or 'emissions' and Newton generally called gravity signal emissions 'spirits emitted' or 'energy emissions'. Gilbert noted that magnetic and electric signal effects decreased with distance from their sources and had some signal range limits and for magnetism at least also some qualitatively different effects at different distances. Though such emissions may be claimed to not be currently directly detectable, many clearly detectable emissions show a decrease in intensity with the square of the distance from their source similar to some of the major action-at-distance forces. Many early scientists were concerned with deriving improved description of natural phenomena, and afraid of or not at all concerned with trying to explain why nature acted as it did. Thousands of years of mere clever thinking had achieved little real, before the experimental science method emerged and produced quite different ideas on the universe. Gilbert's 1600 De Magnete was mostly just taken as being the most expert scientific work using experiments to describe magnetism and how it works, and only a few like Newton saw the significance of its physics theory. Gilbert saw action at a distance as based on signals that bodies emit (effluvia), and to which signals other bodies reacted automatically and invariantly as robots when signals reached them. Despite Gilbert producing the strongest disproofs of many of Aristotle's ideas and methods, his robotic response theory was commonly misinterpreted as an Aristotle animate universe theory, though it was really more an information-handling robot universe theory perhaps more advanced than the simpler mechanical universe theory that Descartes later produced and which won wide support. And Gilbert's universe had less requirement of gods or of humans than Aristotle's or Descartes'. Gilbert himself did many experiments, as did Galileo and Newton though not Kepler, Descartes or Einstein. Gilbert centrally claimed that his many experiments on many materials (including even diamond and other gemstones) proved that no inactive matter existed :- "Aristotle's 'simple element' - and that most vain terrestrial phantasm of the Peripatetics, - formless, inert, cold, dry, simple matter, the substratum of all things, having no activity, - never appeared to anyone even in dreams, and if it did appear would be of no effect in nature." ('De Magnete....' Mottelay, Book 1.17 pp.69). Peripatetic or Aristotlian science had a mixed dead-matter and active-matter science with Gods, while earlier Democritus science seems to have been an only-dead-matter fully determinist push-physics no-God atomism (though the later atomism of Epicurus seemingly had a push-physics theory for magnetic attraction but had non-determinist free-will and Gods). Gilbert's 'no dead matter' physics was somewhat in line with the later 'no matter' philosophy of George Berkeley and opposed by the 'no mind' mechanical physics of Rene Descartes. As against Descartes' 'I think, therefor I am - with a universe of non-thinking things' George Berkeley is almost 'I think, therefor thinking things exist - with signals that prompt their thinking' (his 'Esse est percipi' meaning 'To be is to be perceived' or 'To be is to be observed')- so Berkeley was almost as William Gilbert's physics until the philosophers decided they had to invoke God ? Where Descartes mechanical physics required absolute properties of bodies in them occupying absolute space and not being able to occupy the same absolute space at the same time so that body motion must push, Gilbert physics had only relative requirements. Anything corporeal or non-corporeal (particle or energy) might be a signal, relative to some observer that can respond to it - and anything might be an observer, relative to some signal to which it can respond. The theory also basically required that physical observers, unlike intelligent observers, always respond to signals in fixed predictable science-law ways. George Berkeley's philosophy came close to backing William Gilbert's signal-response physics that was opposed to 'useless dead matter', though seemingly Berkeley never directly studied Gilbert and Berkeley's philosophy ended depending entirely on God quite unlike Gilbert's physics. Gilbert's basic physics theory reasoning was very soundly based as explained by him in De Magnete book 2 chapter 2. He saw action between 2 bodies as needing some type of 'contact', and so concluded that at-a-distance action must involve something being emitted by one body and reaching the other body. But he saw signal 'contact' as not needing to involve pushing and concluded that the attraction, repulsion and other motions of magnetism could not be due to any type of simple pushing. Gilbert like Newton saw pushing as indiscriminate, so that light things like air should be moved to a visible extent by any push-magnetism, push-electricity or push-gravity that moved heavier things substantially, but Gilbert's experiments proved that was not the case. So he deduced that these forces at least were not indiscriminate push forces, but must be discriminating signal response forces - responses when signals touched bodies without pushing them. He proved that magnetism did not affect all bodies the same, but could attract some or repel some and/or re-orientate some - depending on the body and on the strength of the magnetic signal. Very unlike a pushing and not explained by Cartesian, Einsteinian or other non-signal theories. Aristotle had said that action-at-distance needed contact but opponents of Gilbert claimed it needed contact AND pushing or that somehow contact necessarily involved pushing though this did not fit experimental facts. Physics objections to objects touching-pushing has also come from some supporters of 'field' forces as well as from supporters of Gilbert signal forces, though some supporters of field forces did see 'fields' as themselves basically touching-pushing things if not objects - while others have avoided specifying what their 'fields' actually are at all. The zero distance required by Cartesian contact-physics is actually unmeasurable and so unprovable, while the finite distances of 'at-a-distance' physics are measurable and provable. And the differing abilities of Neutrons and Photons to penetrate bodies now suggests maybe that, unlike macroscopic objects, the ability of microscopic objects to penetrate other objects is less affected by 'pushability' or 'massness' properties of the objects than by some 'reactivity' properties. And this maybe backs doubts on pushability existing, though smaller Neutrinos having better penetration than larger Neutrons might give some little support to pushability ? In the 'Newtons Cradle' toy, something may appear to penetrate a series of solid balls though clearly nothing actually penetrates. So the apparent penetration ability of gravity and magnetism might possibly involve some actual penetrations or not. Modern claimed differences in space-occupancy and other properties of 'matter' and 'energy packets' at the microscopic level are maybe doubtful. And for another modern physics argument that things generally do not touch or contact, based on evidence that the outside of atoms generally have electrons which electrostatically repel each other, see No Touching at www.worsleyschool.net/science/files/touch/touch.html. 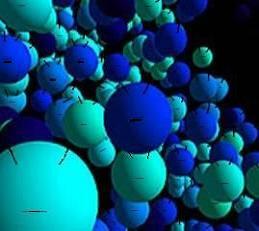 Of course there is more to atoms and to matter generally. Physicists from Galileo to Einstein ridiculed action-at-distance or remote-control physics and some saw this Gilbert 'animate' motion as Aristotlian, especially as he of course often used the scholar Aristotlian words of the time he was writing in - though often with new scientific meanings intended. This has been noted by some like Gad Freudenthal, ISIS 1983 at www.jstor.org/pss/232278 and Stephen Pumfrey, CUP 2002. Some strangely saw Gilbert as in line with Jean Buridan (1300-1358), though Gilbert's motion is distinctly his own in concluding that his experiments proved his new theory of active bodies responding automatically in proportion to different emission signals they receive. Gilbert had studied widely and referenced all technologies and ideas of any relevance to his science - mainstream and non-mainstream both current and from early Chinese, Arab, Greek and other societies. He noted their contributions to science knowledge while disproving many of their errors and producing his new theory. Other physicists largely followed greek Atomist 'dead matter' theory as did catholic church Jesuits (though the 1620s did see some Jesuit attacks on ancient-Greek atomism as supported by Galileo in his 1623 'The Assayer'). And later still physicists were to largely confine their studies narrowly to only what were current local science-journal issues. While he supposed different reasons for why some bodies are magnetic, some are electric and some are neither - Gilbert did not see the different physical forces as needing basically different mechanisms of operation. All forces involved emitted signals and response to such signals. Gilbert basically took all bodies as being simple robots that emitted signals and responded to signals, and this was understood at least by Newton who developed it for gravity especially, but religion saw this as their thinking-spiritual arena needing to be dismissed as occult or alchemist. The key to Gilbert's theory was bodies automatically responding to whatever, but Kepler concluded that the heavenly machine is a kind of mechanical clockwork whose motions are caused by magnetic push force threads. Kepler claimed in Epitome of Copernican Astronomy (1618-21) to have built his astronomy "on the Copernicus hypotheses, Tycho Brahe's observations, and the Magnetical Science of William Gilbert" - with Gilbert's magnetical science misunderstood or misrepresented as a push-forcefield threads science. Of course in 1600 Gilbert's ideas were alien and generally not understood correctly as there were no signal response robots or remote-controls built then - the most advanced machines being maybe the mechanical clock and the compass. And it was the 1890's before Nikola Tesla started working on wireless communication and the 1960's before remote-control technology became common. Of course Tesla was chiefly concerned with action-at-distance technology and not with action-at-distance theory. Gilbert publishing the basic theory in 1600 was maybe just too far ahead of his time. Gilbert claimed to have proven Earth daily rotation as Earth is a magnetic body and all magnetic bodies initially rotate towards any dominant magnetic pole, and space would offer no drag to stop an initial rotating. He argued that Earth's daily tides were chiefly due to lunar attraction and that they hence confirmed Earth's daily rotation, which he also saw as supported by the best astronomical evidence. But as magnetism produces no orbital type motions and the Sun had only a small then undetected annual effect on tides from Earth orbiting, Gilbert seems to have considered evidence then for Earth orbiting to be weaker and his De Magnete seemed to take no public position on heliocentric vs geocentric astronomy - as later Newton took no public position on attraction vs push physics though Newton advanced a more sophisticated science reason for that position. But Gilbert did certainly oppose geocentric or anthropocentric science generally, in opposition to much religious belief of the time. From soon after Gilbert's death it seems the only copy in England of Gilbert's second work De Mundo was held by Sir Francis Bacon who did not help get it published. And he in his 1605 Advancement of Learning, his 1620 Novum Organum and other works repeatedly attacked Gilbert's physics theory ideas while ignoring Copernicus and Galileo and at the same time advancing himself as generally promoting new experimental science. Bacon claimed that Gilbert's physics theory was too big to be proved by his experiments - which Bacon unreasonably claimed were not evidence of the Earth being a magnet or rotating or otherwise moving and were not evidence of how magnetic, electric or gravity attractions worked. Park Benjamin Jr noted, in his 1895 'The Intellectual Rise in Electricity, a History' p.320, that Bacon "attacked and condemned over and over again the opinions of a man who could neither speak for himself being in his grave, nor be spoken for by De Mundo wherein he had set them forth and which in the cabinet of Bacon was effectually silenced and entombed". (see http://ia600200.us.archive.org/6/items/historyofelectri00benjrich/historyofelectri00benjrich.pdf) Some thought that Francis Bacon had improperly used and abused William Gilbert for his own self-promotion as a supposed 'Champion of Science' despite himself having some notable talent. William Gilbert took his degree as Doctor of Medicine in 1569 at St. John's College, Cambridge, and settled in London in 1573 after four years of foreign travel. He was then admitted to the Royal College of Physicians, of which he became first Censor, then Treasurer and finally in 1599 President. In 1601 Gilbert was appointed personal Physician to Queen Elizabeth, whom he attended in her final fatal illness in 1603. De Magnete's opening 'Address by Edward Wright' stated that Gilbert had delayed publishing for almost 18 years, not disputed by Gilbert, which was till late in life and partly like Copernicus who delayed publishing till on his deathbed to try to avoid persecution or attack by peers, though Gilbert did apparently also tell some people about his science ideas long before publishing and it was believed that Queen Elizabeth the First liked Gilbert's science work and later gave him an allowance or pension to help with it. Elizabeth was intelligent and fluent in English, Latin and some other languages and was considered open to many ideas, including those of astrologer and alchemist John Dee, though forming her own conclusions which she could enforce ruthlessly. But she did have one of her physicians executed among others and, like the Roman Catholic christian church, some anti-Catholic christian churches then could also be narrow-minded and kill 'witches' and 'heretics' as in 1615 protestant Germany Kepler's mother was on non-science grounds charged with witchcraft but acquitted - and Gilbert considered the majority of his peers to be useless or dishonest and insisted on proving so repeatedly. His delay in publishing his science seems to have largely been due to the times being dangerous for publishing science, but maybe also partly due to him juggling different advice and 'help' being offered to him on its publishing. Interestingly, the year after Gilbert published De Magnete, Queen Elisabeth enacted a Poor Law to help England's poor. Three years after he published De Magnete, and eight months after Queen Elizabeth died aged 69, Gilbert died aged 59 apparently of the Black Death. Queen Elizabeth 1 died on 24.3.1603 and Gilbert finalised his will on 24.5.1603 leaving all his library books, instruments and minerals to The Royal College of Physicians (who unfortunately lost them). He left most of his assets to his brothers and sisters, and some to friends and employees as well as £10 to the poor of Colchester and the City of London. Gilbert did leave £10 to his local church where he asked to be buried, and left his soul to God, suggesting a man somewhat religious but not over-convinced about churches. He died on 30.11.1603. (Gilbert did well at making money and with 1603 manual wages about £6 a year, £10 was a reasonable amount then, and Gilbert was said to have spent over £7,000 of his earnings on his physics or at 2019 value over £2,000,000) He may have correctly felt that his science could have a tough time without Queen Elizabeth, and asked his younger brother to support his science and publish his final De Mundo manuscripts. A major drawback to publishing shortly before death is that when dead you cannot defend your ideas from unscrupulous attacks then - as with Francis Bacon's attacks on the dead William Gilbert's science while stealing chunks of it to claim as his own pretentious science ideas. His younger brother took on responsibility for publishing the seemingly partly-English preliminary draft manuscripts for Gilbert's second book De Mundo putting his wider Magnetical Science or Attraction Science. His brother had it translated fully into Latin and soon after 1603 he did it seems manage to provide a few people with manuscript copies, certainly at least Prince Henry and maybe also Francis Bacon, Galileo and Kepler. Gilbert's younger brother dedicated De Mundo to Prince Henry who was the young, popular and Protestant son of King James the First of England, who succeeded Queen Elizabeth the First, and who died aged 18 in 1612. He sent several MS copies of De Mundo to the young Prince Henry by 1608, believed to have got from there to the Kings Library and to Francis Bacon (referred to by him in a 1612 publication and passed to Sir William Boswell who published De Mundo) and to Thomas Harriot who mentioned it to Kepler in a 1608 letter. But he could not then get De Mundo published, seemingly due partly to its suppression by Sir Francis Bacon, until in 1651 long after Gilbert's death it did get published though only in Latin - but even Gilbert's Colchester grave inscription is in Latin (though he did write his own will in English, any other of his writing in English being seemingly lost or destroyed). Gilbert, like Galileo and Newton, held a low opinion of the majority of his peers and just trusted that his own proofs and experiments would sufficiently demonstrate the correctness of his theory whatever most of his prejudiced peers concluded. But before Gilbert reached that conclusion (as did Newton later) Thomas More publishing his 'Utopia' in Latin in 1516 in Holland, and in 1551 in English in his England after his execution there for being Catholic, noted that as Plato had concluded basically rulers often have prejudices to which they have long been accustomed. Gilbert's theory of Earth tides more fully detailed in De Mundo was sound and easily beat Galileo's wrong mechanical theory of tides, and probably Kepler and certainly Newton later were also to find that planet orbitings were best explained by attraction physics though neither fully backed such physics which was strongly opposed by the Catholic church especially. But unlike Galileo with his telescope Gilbert prioritized advancing physics over advancing astronomy, which seemingly helped boost the industrial revolution in England more. Gilbert seemed to basically merge the active-matter of Greek Aristotelianism wih the determinism of a Greek dead-matter Atomism by adding 'effluvia signals' to connect the two in his signal-response physics. However, Descartes and others instead chose to entirely reject Greek Aristotelianism and support a Greek Atomism as a dead-matter push physics. But, as early Christianity burnt most of it, we do not know to what extent ancient Greek determinist atomism was really a push-atomism or an attraction-atomism or a mix ? (see https://aeon.co/essays/is-atomic-theory-the-most-important-idea-in-human-history) It may be that Gilbert was actually a more accurate development of ancient Greek atomism than Galileo and Descartes ? Gilbert's attraction science or remote-control science did gain some limited backing especially among protestants, but catholic church Jesuits and catholic Galileo and Descartes supporters were quick to join Bacon in discrediting Gilbert's theory without any disproof of it, and the later 1651 publication of Gilbert's 'De Mundo' was too little too late. While he published no comment on Galileo, Gilbert concluded that his own experiments disproved the push-physics theory that Galileo backed, though privately he did strongly support Galileo's experiments. And Galileo basically published without any relevant evidence his disapproval of the physics theory that Gilbert's experiments backed, though he did strongly support Gilbert's experiments. The very many and wide-ranging references in De Magnete and De Mundo showed that Gilbert has studied exceptionally widely but little else is known of that. All of Gilbert's manuscripts and library were seemingly destroyed in The Great Fire of London 1666 or otherwise lost, and the only known 17th century university teaching of Gilbert seems to have been at Gresham College London and at Clare College Cambridge between 1658 and 1678 and that may well have been little (Gilbert had studied at St John's College Cambridge, and Newton was at Trinity College Cambridge from 1661). Robert Hooke was at Gresham and supported Gilbert's attraction physics, including putting attraction physics ideas to Newton, but Descartes 'dead-matter' Catholic-backed push-physics based on ancient greek Atomism generally prevailed over Gilbert's new 'robot-matter' theory largely by name-calling. Newton at first followed the then-prevailing push-physics till seeing Gilbertian attraction physics as better fitting the mathematics of planet orbits and other physical phenomena. Newton's disgust at Gilbert attraction theory being dismissed by merely calling it occult based on 'prejudice' was shown in him saying that in that case all theories involving unseens should be called occult including Galileo-Descartes push-physics (and logically also including Einstein's theory since nobody has directly seen a spacetime continuum). 1. Various types of robot observer particles that emitted and responded to effluvia force signal emissions, which might mean atoms or parts of atoms and maybe photons etcetera. The internal structure if any of these 'blackbox' things mattered little in Gilbert's theory, only their emission and response to effluvia signals. 2. Various types of effluvia force signal emissions, causing eg electrical, gravitational and proximity responses in some or all of the above particles. The latter seem currently less easily directly detectable than the former. Two main conclusions of Gilbert were that different types and strengths of signal had different ranges - which for magnetism could be less than an inch for a weak magnet to some miles for the Earth's magnetism - and that signal strength diminished with distance. He showed that for magnetism at least effects also had qualitative difference with distance, attraction-repulsion effects over shorter distances only and orientation-magnetization effects over greater distances. He further deduced from experiments comparing magnetism and static electricity that different types of effluvia signal emissions also had different abilities to penetrate matter, seeing low-penetration electric charge signals as more likely material particles and high-penetration magnetic signals as more likely non-material energies or 'spirits' - so his effluvia signal emissions were perhaps in modern physics terms 'quanta' that could be mass or could be energy. (of course higher penetration might also be due to a much smaller size like Neutrinos or due to absorption-and-retransmission of some quantities in some directions.) But some interpreted Gilbert's signal range in terms of a 'force field', though the idea of force fields is a quite different idea requiring all space to be filled with something like an energy version of Descartes material ether. From our atmosphere attenuating with altitude, Gilbert concluded that just a few miles above the Earth was empty space containing nothing - but through which his signals including gravitation effluvia 'gravitons' could pass. Planet orbits not having drag made Newton support Gilbert's empty space, though Descartes like Aristotle and perhaps Einstein thought empty space was not possible largely on other theoretical grounds. It is to be noted that Gilbert did not conclude that magnets or magnetic signals contained contrary properties because they attracted iron and did not attract ice. Gilbert like Newton taking science as not allowing actual contradictions, saw the difference as being in iron and ice having different responses, without any contradiction, to the same unitary thing. Einstein and others unfortunately later made what is maybe an anti-science mistake of taking light (and particles) as both being wave and being not-wave, and adopted the self-contradictory self-disproved 'Duality Theory' instead of accepting that different responses as to light do not imply different source properties as of light. Though Gilbert had been a Cambridge university examiner in mathematics, he somewhat distrusted mathematical deduction as being mere logical philosophising as against being experimental proof science, and so stood by minimal logic and minimal mathematics. He perhaps foresaw the mathematics-only-physics and probability-science problems that emerged later. But maybe the idea of an experimental philosophy against conjectural philosophy needed to be combined with the idea of an experimental mathematics against conjectural mathematics ? And a bigger problem to developing his theory further was the fact that his knowledge of mechanics and motion being pre-Newton and pre-Galileo was limited. A couple of bits of Gilbert were disproved by later experiments, but were entirely inessential to his theory. Kepler unintentionally showed that good mathematics could be successful even within a poor explanation physics, but not until Newton was Gilbert's 'attraction theory' properly mathematised. In the 1720's, Voltaire thought that the English favoured (Gilbert-)Newton attraction physics while the French favoured Descartes push physics - Voltaire - but really perhaps only the English public and not English physicists. The old legal joke "There are three types of unreliable witnesses : simple liars, damned liars, and experts. ", was made a statistics joke as "There are three kinds of lies : lies, damned lies, and statistics." But some supporters of experimental 'real' science might prefer "There are three types of doubtful science : hypotheses, science fiction, and mathematics." And while at the same time as Gilbert studied magnetism, Galileo studied gravity. But gravity produces only one simple unselective attraction effect. Magnetism produces selective attraction, repulsion, orientation and induction effects. And still Gilbert produced a rather better explanation for magnetism than Galileo did for gravity. Gilbert who argued strongly against over-theorising was undoubtedly the better at theorising. While Gilbert produced his useful working mini-magnetic-planet models ('Terrellas'), nobody has made useful working mini gravitational planet models as gravity seems insignificant for normal small bodies and atomic repulsions prevent substantial object compression. (Strangely perhaps it has not yet proved possible to use the fact that groups of neutrons or neutrinos should be more easily compressible.) But with todays radio-control technology it is possible to produce robots or drones that mimic gravitational behaviours. Designing such with spin and a single receptor and single engine with delays would add significant constraints that might maybe give Einsteinian maths to basically Newtonian response, though spin in space itself involves no effort. A range of different alternatives for mimicking gravitation would certainly be possible as discussed in our Gravity section, but it would significantly expand the possibilities for actual astronomical experiments and more. Gilbert saw the term 'attraction' being chiefly used in England to 1600 as meaning push-physics 'pulling', but not too long after his De Magnete was published Newton and others could see the term 'attraction' being more used in later-1600s England as meaning attraction-physics 'responding to signals'. This did not really happen elsewhere and the first detailed published opposition to Gilbert's physics theory was by Jesuit catholic Niccolo Cabeo in his 1629 'Philosophia Magnetica' which though generally Aristotlean adopted a poor greek-Atomist matter-pushing-matter explanation of magnetism, electricity and gravity that Descartes later supported but Newton disproved. The catholic christian church founded the male Jesuit Order, or Society of Jesus, in 1540 'to fight to defend and propagate the catholic church' basically by opposing protestant ideas and science and to promote catholic alternatives, though a Catholic science was to be a tricky option. From generally opposing Protestant Christianity the Jesuits were soon prioritising opposing emerging Non-Aristotelian Science and in the early 1620s that included some attacks on greek atomist science. But that position soon crystallised turning the catholic church to supporting greek-Atomist physics against protestant attraction physics. Despite Gilbert disproving much of Aristotle many times in his works and his physics having no apparent place for gods, Gilbert's theory became labeled by many physicists as 'Aristotelian' god-derived - and was rejected in favour of the god-separate Descartes mechanical-push science (fully published by 1644) but maybe akin to throwing out the baby with the bath water ? Information handling robots and remote-control are a more modern technology than mechanical robots, and modern information theory is now doing much work that is basically along Gilbert signal theory lines, though without any great impact on physics theory as yet. Despite the almost universal use now of television remotes and mobile phones all acting in response to remote emitted signals, which perhaps at least partly confirms Newton's view that Gilbert signal theory was at least plausible ? But the majority of physicists still claim that action at a distance is impossible - when most people know it IS possible and works by SIGNALS emitted and responded to as Gilbert concluded that magnetism, electric charge and gravity work. Gilbert termed those natural emitted signals 'effluvia' - from Latin at the time generally taken as meaning 'non-visible characteristic emissions from bodies such as their smells'. But in his preface to De Magnete did clearly state that his use of words often involved new scientific meanings for them. While his natural signals emitted by objects causing magnetism, gravity etcetera were termed 'effluvia' by Gilbert, they were generally referred to by Newton as 'spirits emitted'. But Gilbert saw the evidence as indicating that some 'effluvia' natural signals emitted were probably corporeal particles and that only some were probably non-corporeal non-particle energies or 'spirits'. The actual observed difference between magnetic behaviour and gravitation behaviour is substantial, so that producing one simple theory to cover both is a substantial problem to any physics. Hence magnetism involves attraction, repulsion, orientation and magnetization affects, while gravity involves only one simple attraction affect. Gravity being basically simple could easily seem to suit a simple Descartes mechanical push theory, which was very difficult to apply to magnetism. But magnetism being more complex perhaps more suits a Gilbert signal response theory, which also was easy to also apply to gravity as attraction theory as Newton showed. And notably gravitational and electromagnetic forces have some common aspects that Gilbert signal response theory handles well. They both have directionality though it may be only directionality relative to another object, and their action also seems to involve a mutuality relative to another object. In fact these forces may well have no objective existence for one object alone, in line with William Gilbert's signal-response theory of forces ? And signal physics has some other interesting aspects, see our Light. Some like Einstein who followed Descartes basically and took gravity as being a fundamental, took magnetism as being an inessential of less importance to physics theory. Though in science all well confirmed facts are basically equal, Newton did somewhat little to oppose the magnetism-does-not-matter position. But the fact that magnetic and electric charge forces give BOTH attraction AND repulsion behaviour AND other responses AND only on selective bodies, does strongly suggest that the 'force' of these forces at least is NOT in the force itself but in bodies responses - as in Gilbert's signal response theory. A big problem for any push-physics explaining is that pushing is basically indiscriminate but the actual universe includes different attractings including some discrimination attractings as well as different repulsions including some discriminating repulsions and other discriminating behaviours more consistent with an attraction physics than with a push physics. And Newton could get his workable physics maths from attraction physics but not from push physics. 1. Every observer body will remain at rest, or in a uniform state of motion unless effluvia signal emissions act upon it. 2. When effluvia signal emissions act upon an observer body, it accelerates itself proportional to the signal strength and inversely proportional to the mass of the body and in the direction required by the signals. 3. Every effluvia signal action evokes an equal and opposite effluvia signal emission reaction. 1. Observer bodies emit various effluvia with speed of light velocity in response to various effluvia being received by them. 2. All motion and other natural phenomena are caused by this process (including seemingly causeless radioactive decay). 4. All observer bodies are aggregates of effluvia. Then we might have the basis of a relativistic quantum mechanics physics without fields or continua, or of a no-ether Descartes particle push physics without fanciful corkscrew-particle-push or boomerang-particle-push attractions ? Maybe a high-reaction graviton causing the emission in the same direction of a particle pair of a similar low-reaction graviton plus another high-reaction particle (normally multi-directional) giving the gravity momentum effect ? Whatever it would mean, that physics would be about how many different types of effluvia exist and their properties, how many different types of effluvia-aggregates exist and their properties including what influences effluvia aggregation and dis-aggregation ? And maybe unlike mass, charge and spin could be just signal response properties ? One apparent difference between Gilbert-Newton signal attraction theory and Descartes push theory is on 'action and reaction are equal and opposite'. Though Gilbert and Newton proved that this did hold for attractions, it may seem that a push must give an equal effect while a small signal might give a big effect. But this apparent problem can also occur in mechanics and can be fully resolved with lever, trigger and conversion (eg E=mc²) effects. And if particles like neutrons are themselves complex systems, then a graviton signal might trigger a series of events including eg neutrino emission that actually produce motion responses ? The supposedly separate two processes of force-production and acceleration-by-force, may actually be basically one process - ie. bodies in Gilbert theory terms maybe basically respond to external forces by accelerating themselves by producing their own forces as maybe by emitting small particles in response to received signals like remote-controlled rocket engines. This could give a natural 'equivalence' of forces and acceleration having a wider cover and making more sense than Einstein's little Equivalence Principle applying only to gravity. Supporting this is Gilbert and Newton often positing the mutuality of forces between multiple bodies, and as we are in a multiple body universe there can maybe be no proof that one single isolated body would have any force of gravity or any other force ? This mutuality seems clearly related to the 'entanglement' property in quantum information theory (from experiments suggesting that atoms can split one photon into two mirror 'entangled' photons of eg opposite spin polarisation and half the energy with some claiming that these remain somehow actually linked or 'entangled' even when distantly separated). A signal physics can more naturally handle multiple-signal emissions having related information and/or separate mutual signal emissions having related information, without requiring any mystical 'entanglement'. In fact the first published discussion of 'corpuscles being entangled' was in Gilbert's 1600 De Magnete. But the question is are 'entangled particles' connected by magic or by signals - or not connected and just a related-creation giving related properties ? And yet most weirdly no modern physicist at all tries to relate distance-entanglement to action-at-distance as originally put by William Gilbert and backed by Newton but was widely attacked by most physicists completely unreasonably without proper study ? being equal and opposite to the attraction by the body on all other bodies summated for forces applying. Gilbert's physics was a complete explanation physics whose description was somewhat complicated with its inclusion of (signal) emissions and self-moving responses to them that he considered needed for complete explanation which he saw as required for a science to be really scientific. Some who supported Gilbert's physics tried to simplify their description of it at times by either omitting its responses or omitting both its emissions and its responses. This did not always mean that they believed anything different to Gilbert, but did readily lead to such misunderstandings. And such omissions seemed to allow some possible very un-Gilbertian Galileo/Descartes type push or pull mechanisms being involved, so possibly reducing some objections from that quarter but presenting an incomplete science that could be called mysterious. But Newton was happy to justify in his Principia such omission. The main supporters of Gilbert, in whole or part, were Johannes Kepler and Francis Bacon and later Robert Hooke and Isaac Newton though they did not at all acknowledge Gilbert and Newton insisted that complete explanation was not needed in science. Hence in his Novum Organum, Francis Bacon compared gravity with magnetism and wrote in line with Gilbert that 'whatever produces an effect at a distance may be truly said to emit rays' - though, unlike Gilbert, Bacon commits to nothing specific about such rays or how they work. And Robert Hooke in a communication to the Royal Society in 1666, wrote "I will explain a system of the world very different from any yet received. It is founded on the following positions. 1. That all the heavenly bodies have not only a gravitation of their parts to their own proper centre, but that they also mutually attract each other within their spheres of action…." This is pure William Gilbert signal-response physics almost word for word, where 'spheres of action' are his signal ranges, though here Hooke does actually omit Gilberts signals and response mechanism and claims to be stating his own new idea. Yet that year Hooke also wrote that Gilbert began to imagine gravity a magnetical attractive power, inherent in the parts of the terrestrial globe and in his 1678 “Cometa” he wrote that the planets “may be said to attract the Sun in the same manner as the Loadstone hath to Iron.” Newton also wrote of significant comparison between gravity and magnetism, so that ideas of unification of gravity and electromagnetism clearly much pre-dated Einstein. Gilbertian signal-response physics also more firmly excluded time-reversal in nature than the Cartesian reversible-push physics that was commonly to be wrongly ascribed to Newton. If physical actions are all responses to signals, then response must always follow signal giving time and making it one-directional. So a bar-magnet will attract a piece of iron but there is no reversing that, though an electro-magnet can have its poles switched or 'reversed' that is not time reversal and evidence also does not support any reversing of gravity. And surely a physics where an effect does not always follow a cause, cannot be a scientific physics ? Hooke and Newton clearly did correctly understand Gilbert's physics basically as a signal-response physics though not all of them fully agreed with all of it, but many have studied Gilbert and not at all understood his theory being instead mesmerised by his declared unusual use of language - as seen in the unfortunate modern study 'Francis Bacon and Magnetical Cosmology' by Xiaona Wang, University of Edinburgh in Isis, Volume 107, Number 4, December 2016. Gilbert's attraction physics theory held some marginalised support mainly in England to Newton's time, against the growing influence of Galileo and Descartes supported push-physics. But William Gilbert and his magnetism and electricity did significantly impact early science mainly in England and at least into Newton's time, though it was to be many years later before that particular area of physics was to itself give any further real advances. Much later others like Volta, Faraday, Maxwell and Tesla made some further advances in electromagnetism to great effect with both materials chemistry and biology being significantly involved, but failed to deal with major issues, and of course Einstein failed entirely to deal with any magnetism issues. But of course Gilbert's signal-response physics was basically an advanced information-handling physics way ahead of its time. While physicists like Faraday and Maxwell did very good work, it really only poorly half-explained the simpler aspects of magnetism. Nobody did any real theory follow-up work on the actual full experimental magnetism of Gilbert and Tesla. And it is a bit of a mystery why later no theoretical physicist, including Einstein, thought to work with Tesla ? A static electric charge stationary on the moving Earth, produces NO magnetic response from a detector compass that is also stationary on the Earth - but it DOES produce a magnetic response from a detector compass that is moving relative to the Earth. And a still or uniform velocity charged particle generates a static electric field, but an accelerating charged particle generates a fluctuating electromagnetic wave. This fits poorly with most types of field physics theory, and better fits a Gilbert style theory where no 'magnetic fields' as such exist but electric charge signals are emitted and detectors simply respond electrically and/or magnetically to such signals motion relative to themselves. A stationary permanent magnet does produce magnetic responses from another stationary permanent magnet, but the absence of macroscopic relative motion can still allow of their microscopic atoms or elementary particles having some relative spin or other motions. A 'stationary' electric wire can carry a moving electron current, and generally 'rest' can include motion and vice versa. Moving any normal macroscopic magnet slowly will emit very low frequency long wavelength (millions of metres, 1.24- peV) E/M waves, and needs to move extremely fast to emit higher frequency shorter wavelength (around 1 metre, 1.24+ μeV) E/M waves like standard radio waves. Eg rotating a magnet at frequency f implies E/M emission with a wavelength λ=c/f relative to some E/M detector ? This does give the problem of infinitely slow motion, if not also of infinitely fast motion, and also of absolute motions versus relative motions ? Of course it also relates to Newton's physics relating accellerations to forces. Magnets only produce induced electric currents in bodies at a distance from them if there is relative motion between them, as studied by eg Faraday and Maxwell, but otherwise of course a static magnet still produces magnetic induction or resonance in suitable magnetisable bodies ! With no relative motion a magnet does, by induced magnetic resonance, orientate the motion of charged particles and magnetisable bodies near it, which is affected chiefly by the extent to which electrons and/or protons are in bodies paired or not paired. More recent magnetism experiments seem to show that a + or - electric charge in (relative) motion produces a magnetic field that can affect at least some other bodies, and at least some + or - electric-charged bodies in (relative) motion can respond to a magnetic field. So magnetism perhaps concerns only the (relative) motion of two or more + or - electric-charged bodies ? But such 'motions' can just involve claimed sub-atomic 'spins' that are not visible motions or may actually be non-motions ?! And standard experiments with naturally-magnetic magnetite ore or with bar-magnets do seem to show at least some magnetism apparently needing no motion and maybe no + or - electric charges ? So maybe there are really two different kinds of magnetism, one maybe from + or - electric charge relative motion and one from static +/- charge displacement in some bodies having both + and - electric charges ? Study of both of these motion and static magnetism phenomena have still not clarified the issue of exactly how magnetism works, as between the two basic options noted by Newton of either a Maxwellian medium/continuum pushing bodies or Gilbertian information signals that bodies respond to. Einstein supported the former while failing to prove it and Newton favoured the latter and now there seems some growing support for the latter from information signal physics. 'De Magnete' 1600 London edition title page :- - Click image to enlarge, or to get click-enlarging image. 'De Magnete' 1628 pirate edition title page :- - Click image to enlarge, or to get click-enlarging image. GILBERT initially mainly saw himself as a chief advocate of new experimental natural science examining everything, as against the mere dogmatism and philosophising of old natural philosophy, religion and mathematics. He experimented and he talked with miners, sailors and others before writing his De Magnete somewhat in the polemic anti-establishment style that Karl Marx was to later write his Das Kapital and which Galileo was banned from using. While he attacked 'mere theorising', the full title of his De Magnete indicated that scientific proof needs both experiment and theory argument and he did further see himself as the originator of a new signal response physics theory covering magnetism, electricity, gravitation and mechanics - which he sought to prove chiefly through his experiments on magnetism. Gilbert implied perhaps wrongly that an experiment could be interpreted wrongly or differently only if you considered things far removed from the experiment, but that is perhaps a mistake that many scientists even today make. Park Benjamin Junior noted in his 'The Intellectual Rise in Electricity, a History' (1895), p327, that Gilbert's aim was not primarily the making of electrical and magnetic discoveries, but the establishment through such means of a great theory of the physical structure of the universe. Gilbert did prove by replicable experiment both action-at-distance and action-through-matter against any kind of push-physics, and both apply at least to both magnetism and gravity. And finally Gilbert saw his lesser role as establishing some of the real facts of magnetism and electricity - though commonly only this role got properly acknowledged. In his later writing, maybe seeing experiment as becoming more accepted, Gilbert promoted a more fully positive view of science theory. While there should be freely available some English or at least translatable online versions of Gilbert's two major publications, his 16OO 'De Magnete' and his 1651 "De Mundo Nostro Sublunari Philosophia Nova" ('A Philosophy of our Sub-lunar World, or A New Science of everything under the moon'), somehow this seems not fully the case. We will try to put more of it online on this website soon, but for now our Gilbert sections have only English extracts, the new English De Magnete and full online Latin versions or links - including good translatable Latin online De Magnete and De Mundo. For a summary of a 'Gilbert-Newton' view of gravity and like forces see Attraction Theory of Physics. And see an interesting English translation of the 1556 Latin 'De Re Metallica' by Georgius Agricola, On the Subject of Metals, referenced by Gilbert. In nature atomic fusion in stars relies on gravity and maybe heat, but as a related technology would probably have to rely on magnetism and maybe heat - but heat being causal here is actually unproven, though atomic fusion certainly produces heat, and a cold fusion technology may be possible using maybe some attraction only ? While atomic fission seems to chiefly concern the atom nucleus and so be nuclear, there seems little reason to think that the same applies to atomic fusion. And perhaps of some interest Gilbert's strongly anti-philosophising/reasoning and pro-experiment/experience position was maybe reflected around 1670 in 'Satire Against Reason And Mankind' by John Wilmot Earl of Rochester though that interesting work was perhaps just anti-religion, anti-government, anti-science and anti-social ?